While I’m relaxing at the seaside I’m so lucky to have a great poker of guests, let’s start with the super-awesome Olu, one of my classmates at Lauren’s course Patternworkshop (affiliate link) and, formerly, the very first Serger Pepper’s guest. She’s sharing with us a free pattern for some linen bloomer shorts. It’s your turn, Olu, here’s your microphone! Hi, I’m Olu from Needle and Ted and I’m delighted to be guest posting here today. I have been sewing regularly for my children for nearly a year but I must be the slowest person ever. I get distracted, I make mistakes, I forget where I put things. It’s ridiculous. But these bloomer shorts took me just 1 hour to sew. So I figure if I can make them in an hour, then anyone can. If you have a child age 2-3, click on over to Needle and Ted to get your free pattern. Print it out, stick it together and cut some lavish linen. You don’t have to use linen, but linen is cool, it deflects the heat and it never goes out of style. You will need all the usual sewing tools; sewing machine, scissors, pins, matching thread etc, but also some shirring elastic and about a meter of 1cm wide elastic. OK, so now you have everything you need. ARE YOU READY? Check your sewing machine settings. GET SET. Check the time. GO. Note: The waist on the linen bloomer shorts above measure 52cm, different fabrics shrink to different percentages after shirring. My version has a seam down the front and back. This is because the fabric was upcycled from a pair of my mum’s unwanted trousers and I cut them at the side seam. In the tutorial, l there is no seam at the front and back only at the sides. Thanks for having me Irene! Nice tutorial, and quick sewing! Lovely tute & free pattern! THANK You Olu!! I have some beautiful aqua, iridescent linen that would make a “Mermaid” like pair of bloomers for my Mermaid loving Granddaughter!!! THANK YOU again!!! 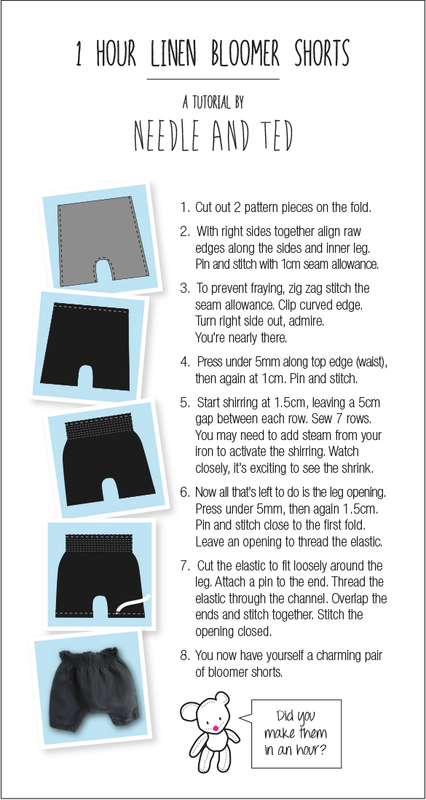 Love the shorts, but have never shirred before – don’t even know if my basic sewing machine is capable of it. Can you just put elastic in a casing and if so, what would I need to do to amend the pattern to allow for this. Sorry – I am really a beginner sewer. I think that elastic in a casing would give almost the same effect but it’s not a variation I would suggest to a beginner, maybe it’s better if you find a free pattern with an elastic casing… so you can see all the steps you need to do and how to modify your pattern! I would really love to hear more from you if you try with the elastic thread and, maybe, you need some more help! Hi, I’d love to make these shorts but the pattern link only leads to a post telling me to come to this post. Is the pattern still available for download?